I wanted to share three cards for Halloween- the first two are digital images -this first image is a digital image perfect for a Halloween card. My kids are in High School and College- so I thought this would be a perfect image for a kid that age. The image is available at FCD on Pamela's Blog for just one dollar. I made it in a couple of different colors (as my twins are a boy and a girl). I found this Dp at Target for one dollar too..... (I am saving my husband so much money!!!). The image is colored inith Copic markers (C-0,2,3,5,7 and black 100, E00, G24, R24 and 3 sharpie markers in shades of purple). There is Shimmerz Angel Wings on the clouds and the moon, and over the purple on the inside of the cape. The sentiment reads,"Once upon a midnight dreary". I cut the sentiment out of the BG paper. Unfortunately, I did not bookmark where this image came from. Again, for older kids it is a great image- not too juvenile and not too sweet. We go from all 5 of us here to one child- and the one who is at home is involved in school sports, and studies in the rest of her free time. So, we go through a lively busy house to a very Q_U_I_E_T house......So, I thought it would be something that would make the kids chuckle. 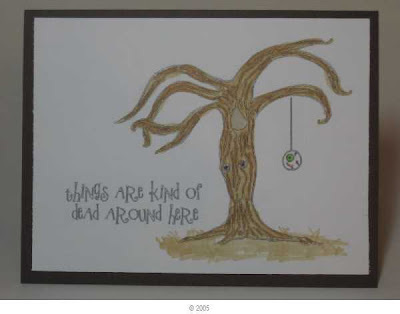 I love this image with the eyes on the tree and the eyeball hanging from the dead branch- if you know where it is from, please drop me a line. The sentiment says "Things are kind of dead around here". Finally, not my idea- I CASE'd this from one I saw at a SU stamping event I attended. Too cute, don't you think? The outside top 1/2 was run through the Big Shot with a texture plate, and color brayered on the raised part. I stamped the sentiment and applied the punched hands- which are folded in 1/2- part on the front and part on the inside. Then the card was put through the Big Shot with the die that cuts out windows. The punched face was applied to the inside so it would peek through the window. I have included a picture below of the card opened so you can see the entire punched image. My sister has younger kids- who will get this card in the mail- I hope they will like it! They live about 1/2 hour from us, and we do not get to see them too often, but it will be a big thrill if they stop by in their costumes- they are 2nd, 4th, 6th and 8th grades- so may prefer to be with their friends- their older brother is a senior in High School....so not out Trick or treating. I will look forward to seeing all of your Halloween creations- Thanks for a great challenge! Thanks for stopping by! Have a wonderful safe Halloween. I have a huge pile of cards I need to make, so I took this opportunity to follow the MoJo Monday sketch. 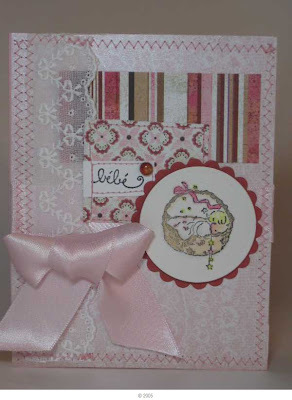 One of the cards I need is a card for a Baby Girl- Oh how I love lace and ribbons and sewing on cards! The base CS is from a stack I purchased at Joann Fabrics called the Luxury Stack- it has a beautiful sheen on it. I used a piece of Whisper White and used a Zig-Zag to put the pink Luxury Stack on the card front. I use a piece of Eyelet lace for the left side strip, and sewed it on with a Zig-Zag stitch. I used Basic Grey Bittersweet for the DSP. The word is from Hampton Arts. The little baby in the basket is C-1994 Rock-a-bye Baby by All Night Media. The BG scallop is a nestability with Ruby Red SU CS. The image is colored with Copic markers. I used a Sakura Gelly Roll pen t.o add highlights to the stars above the sweet baby girl and hanging down from the basket. The final touch is double sided Pink Satin ribbon by Offray- it is heavenly to touch and looks so pretty on the card. 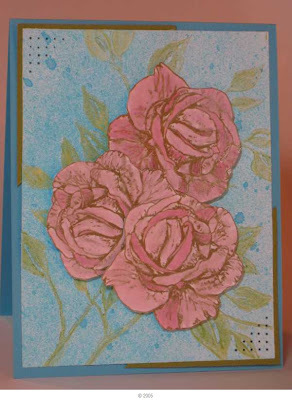 I added a Dew Drop to finish off the card. Saturday Spotlight with Hidden Potential has a challenge this week for making Treat bags for the Holidays. I discovered this after I started looking in the Resourse area at Splitcoaststampers looking for a 2-4-6-8 bag to CASE Rachel Hope, who is this week's Featured Stamper at Splitcoast . I could not find the exact tutorial I wanted, but came across this cute tutorial for Cammies Triangular Treat Bag. Apparently, I get easily distracted, because the next thing I know, I was cutting strips of CS and making triangular bottoms to fit them........ I used the Pawsitively Frightening stamp set by Firecracker Designs by Pamela to dress up the front of these little boxes. 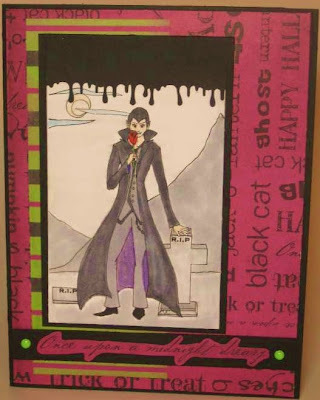 I stamped the images and sentiments with Tuxedo Black memento Ink and colored them with Copic markers. I stamped the Cat's head and witch hat again, and popped it up on dimensionals- do you like the 'Out of the Box' look with the cat? For the second box, I stamped the Caldron and topped it with the sentiment. It is also colored with Copic markers. I took purple and Pumpkin CS and put it through the crimper for the inside of the treat bag. I used a rectangular punch and used $1.00 ribbon from Joann that is double sided orange and black with stitching on the edges. Happy Birthday Artistic Outpost! 2 years -young!!! I have quite a few of the Artistic Outpost stamps- I just love them so much! There has been a sketch challenge on the Artistic Outpost Blog for ages, and I have had it on my "To Do" list for ages. Today is the deadline....... I had a couple of other ideas in mind, but since there are less than 70 days till Christmas, I think I better make as many Christmas cards as possible- hopefully Jesus' Birthday will count as the appropriate sketch theme! So, here is my card for the sketch- the stamps do all of the work! The next panel- the Santa is stamped in black and then Antique Linen is applied to the top with the felt and the felt handle. Then, use aged Mahogany over the bottom, and then distress the top edges with the Mahogany. Use Ruby Red cardstock to back the Santa image. 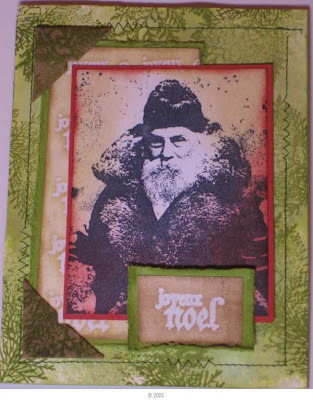 Stamp the Joyeux Noel again in Versamark and clear emboss. Back with Old Olive using the torn Frame Technique technique. 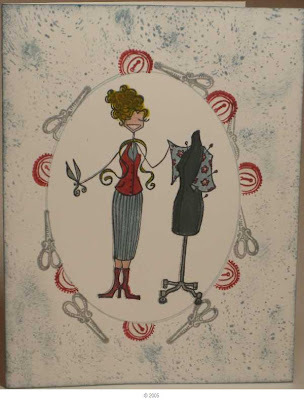 I stitched the BG with a straight stitch and a zig-zag (I just love sewing on cards). Lastly, I took chipboard and covered it with Antique Linen, then stamped the branch with Peeled paint. I look forward to all of the new releases and the cards the DT makes with the sets. Happy 2nd Birthday!!! The Bloggers Challenge today is a one layer card- this was not too easy for me- because of my color choices- I was using the SU color combo chart online, but was still ending up with some really bad cards...... So, I changes directions, and went to my old standby- any shade of Blue will do for me! I used a Technique Junkies technique called Masked Frames from the 12/08-1/09 newsletter-my first time trying this. I used the largest oval frame from my nestabilities and made 2 masks- one to stamp through and one to put over the image while I added a touch of color to the outside- it was too 'naked'...... The image is from Stamping Bella . I colored it in with Su markers. I added a little Shimmerz on the boots and on the flowers on her vest, and put White Gel Pen in the middle of the flowers on her vest. The images around the masked Frame are from a retired SU sewing set (it says C-1998 on the stamp). The main colors I used are Bordering Blue, Ruby Red and Gray. I used Itty Bitty Backgrounds in Bordering blue on the outer edge, and sponges a few flecks of it on the card and around the edges. Please stop by the other Bloggers Challenge players to see their awesome creations for this challenge. I have been so busy that I have not been able to stamp in about a week- that is terrible, isn't it? And, I had a bit of free time today, but I had a little car accident last night on my way home from work, so get to spend the afternoon getting an estimate...... (No injuries to anyone in either car thankfully). The image was watercolored with SU markers for the ink. 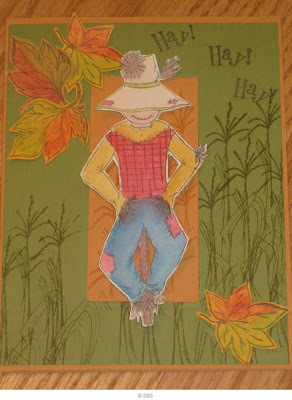 The corn stalks were stamped with Old Olive and More Mustard across the BG, and the leaves are stamped on mustard CS (from SU) and watercolored with Rust, Orange and Old Olive. Welcome to the Firecracker Designs by Pamela monthly Blog Hop. I have a card to share, and then some exciting news....plus a coupon code for you to use while the blog hop is going on. 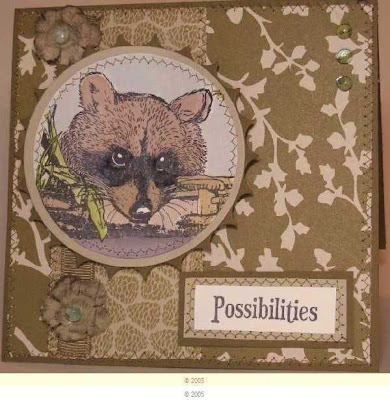 We are asked to create a card with mesh using the Stamp Set we are assigned to this month. My set is called Riley Raccoon. Our challenge this month is to use mesh. The official start time of this Hop is Friday, October 16th, at 8:00 AM (EST). If you arrived early, please be patient as all the links may not be live yet. I decided to use the Faux Silk technique- I learned this from the Technique Junkies, but I am linking to a great tutorial on SCS. This is a perfect technique if you do not love to color, or if you are not in the mood to color......(or if your stamping stuff is at home and you are on the road.....). Stamp the image on tissue paper. Color it in with chalk and q-tips. Crumple up the tissue paper, then uncrumple it- but leave some wrinkles in it. 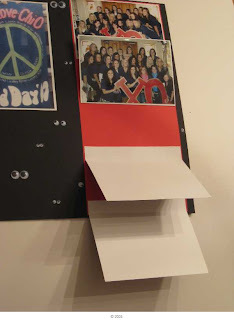 Cut out a piece of cardstock that is the size you want the image to be on your card. Cover it with glue, then lay the tissue paper over that. Let it dry, then mount and embellish your image as usual. I mounted my image on a dark yellow/mustard CS, then layered it on a DSP called Indian Summer, Savanna by Lasting Impressions. I layered that on top of Kraft CS with a piece of mesh over it. I stamped the sentiment, layered it and added a couple of the mushrooms from the stamp set. Finally, I added a button with a piece of DMC tied in a knot. Did you know it is Sweetest Day this weekend? This is going to be my husband's card- he has seen it, even offered creative advise while I was making it! Pamela is offering a coupon for the duration of the Blog Hop this weekend- enjoy 15% off by using the checkout code hopidays. (Magazines excluded). 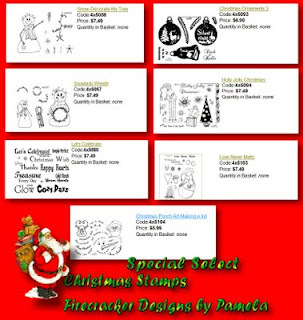 While you are over at Pamela's webstore , check out the new stamps that have just arrived for the Holidays- I love the new word set, the set called snowchild, the mouse, the quacky duck set....... Check the What's New tab at the webstore to view these sets. OK, to continue the circle, you will need to hop on over to Tesa's blog and keep going until you’ve come back to where you’ve started! Thanks so much for stopping by- remember to comment on all of our blogs to be entered for Pamela's prize. 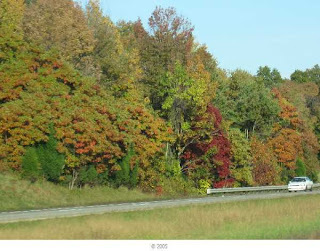 I arrived in Kentucky safely- admired the scenery- the leaves are starting to change colors in Southern Indiana- so pretty! 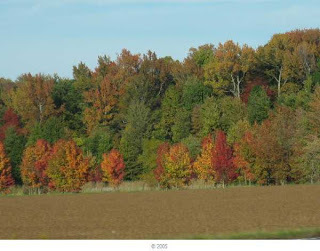 There are photo's I took (while driving) to Kentucky on I-74 South in Indiana between Batesville and Lawrenceberg . There are miles and miles of driving tree-lined highway- it was really pretty. I will be heading to Ohio State to see my daughter Katie on the way home, so will not be driving back this way- too bad- it is soon to be really magnificent! Thanks to everyone for playing - my first blog candy ever! Ten minutes or less is not usually my style, but I did it tonight!!! It took me longer to take the picture and resize then upload my picture than it did to make this card- Wahoo!!! The brayer technique is from the TJ newsletter April/May 2006-and it is called Starburst. I used The Autumn Kaleidacolor pad and the brayer to apply color to a glossy and a matte piece of CS. I stamped the flower on the glossy CS, and the leaves and the sentiment on the matte. I popped the leaves up on dimensionals and card is done! 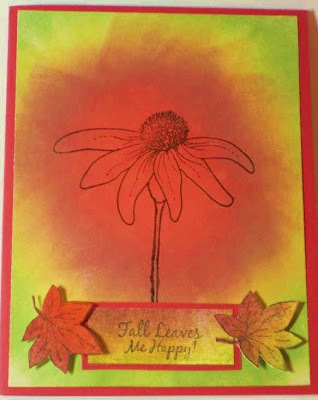 These stamps are called Fall Flowers and are made by Firecracker Designs by Pamela. I am headed to Kentucky in the morning- my Dad had a Total Hip replacement last Monday- I planned on going earlier in the week, but caught a terrible cold and did not want to get him sick. If you would please keep him in prayers for a speedy recovery and no complications, it would be greatly appreciated! What a fun challenge- I have tone of stamps with animals on them. This one is one of my favorites- I used Copics to color it in- my first time since I did not have Copics until Christmas of last year! This stamp is copyright 1992, so one of the first I purchased. 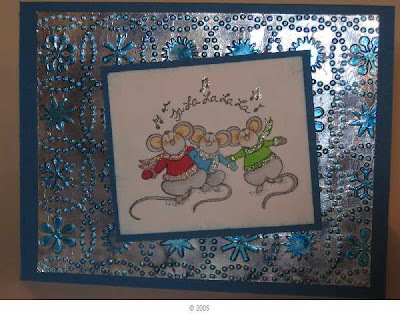 I stamped the mice in Black Tuxedo Memento Ink, and colored the image in with markers. RV29, RV32, C0,C2, C3, B02, E0000, E00, E02. YG17, YG06 and Sakura Gelly Roll Pen for the glittery effect. The technique is called AI Foil by the Technique Junkies Aug Newsletter. The CS is Stampin Up retired pacific Point. The Stamp is by Embossing Arts. (I am working early Friday, so am posting late Thursday night- the other blogger Challenge players go live Friday AM). Soft Suede. The DSP is called Autumn Traditions from SU. 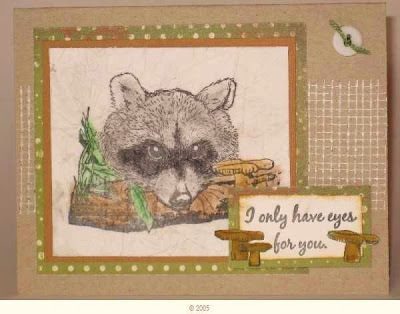 I wanted to showcase a stamp set from Firecracker Designs called Riley Raccoon for my card. He fits perfectly with the color of the DSP, don't you think? I stamped Riley in Tuxedo Black Memento Ink. Colored him in with an Aqua painter using Soft Suede reinker, then River Rock reinker, Close to Cocoa and a light touch of Choc Chip-markers scribbled on a CD case and also aqua painted. The log and mushrooms are painted in Soft Suede, the leaves in Old Olive. The raccoon face 'mask' and the lower base in Black marker and then aquapainter over the marker. Finally, the sky was watercolored in Soft Sky. I did not like Riley directly on the Soft Suede, so cut out a medium circle from Saraha Sand, then backed with pinking circle nestability in Soft Suede. Next I stitched the DSP to the base of the card with a zig-zag stitch. Next, the up and down strip was zig-zagged. I sewed the 1/2" Soft Suede ribbon on so the polka dots are down......using a straight stitch. Now, if you decide to do this, just make sure the card is open.......ask me how I know this......hahahaha. 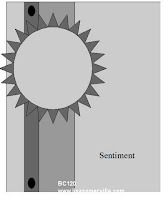 Next, according to the sketch, I need to add something at the top and the bottom of the ribbon strip area. I used a new TJ technique called Decorated Pretties- used Soft Suede to dye them....and then added a blue Dew Drop in the center. 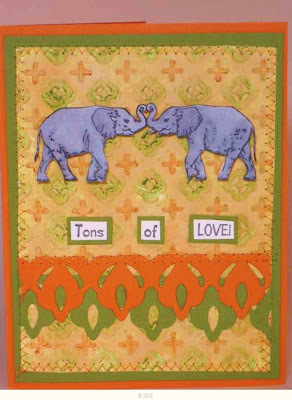 Now, on to the sentiment- I stamped it on White CS, and layered it on Sahara Sand then Soft Suede. I was enjoying sewing, so stitched a little more so to bring the card all together. I added 3 more Dew Drops in the Top Right corner to satisy my odd numbers are appealing to the eye rule......... The finished card measures 5 1/2 x 5 1/2. I have in hand the new TJ newsletter, and had a bit of fun trying the technique Embossed Crayon resist for the second time. I really love floral stamps so much, so I chose to use these pretty Roses with the leaf background. I stamped the roses in Versamark, and embossed them with Gold EP. I colored them in with Copic markers R81, R83 and R85- very beautiful colors IRL! I put them on dimensionals. I spritzed the BG with the CB embossing with Blue Slies Glimmer Mist. What could be better than Pink, Blue and Glimmer? I just love the combination. I did not feel I could add ribbon without distracting from the Roses, so I added a one more element to finish off the card- piercing in the upper Lt and Lower Rt corners. Card Stock is Old Olive and Temp Turquoise from SU. Thanks for stopping by! 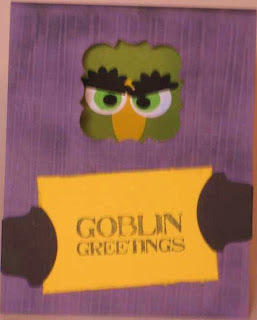 Hope you enjoyed my card! 10 year old Aly loves to stamp. Her Mom let her post a Blog, where she posts a sketch challenge every other week- and each participant has the chance to win Blog Candy. So, I decided to really celebrate World Card Making Day, I would offer additional Candy- and this is my first ever blog candy- for anyone who finds my post and participates in Aly's challenge. First, this is the sketch Aly drew (above....pretty challenging for a 10 yr old if I may say so myself!). Below is my interpretation of the sketch this week- which is also a challenge for our SCS Sweet Dreamers Blog group- to participate in the sketch. Deets for my card: I remade a previous card! I found appropriate DSP to use- I have been using lots of DSP lately- this is by Basic Gray. I set out the DP for the challenge, and chose Ruby Red as the matching card stock. I cut out my image using Nestabilities circle and scalloped circle. The image is Hello Friend which is made by Firecracker Designs by Pamela. I used the marker Watercolor technique on the main image, and she has flower soft added on her hairband (also from Firecracker Designs by Pamela). I added the ribbon and the flower to complete the Sketch Challenge. and post a link to your card. 3)Come back to my blog and leave a comment, with a link to your card made with Aly's Sketch. (Please make sure I have a way to contact you- leave an e-mail address). 4)Post your card on Splitcoast if you have an account and with a link to my post or Aly's sketch post, then leave me your Member name (aka mine is mcschmidty) in your comment, and I will add your name in for a second chance to win. 5)There is one more week of Aly's Sketch- so a random number will be chosen NEXT Sunday, October 11th from those that leave a link with a sketch to a card on Aly's blog. You also have a chance to win Aly's 'candy' as well. 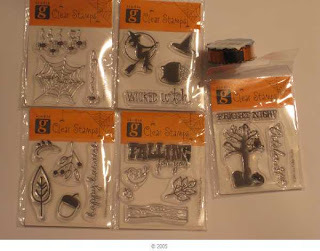 There are 5 Studio G stamp sets here and one small spool of double sided ribbon. I will ship internationally as well-so please pass the word. Thanks for encouraging the creativity of a young child! 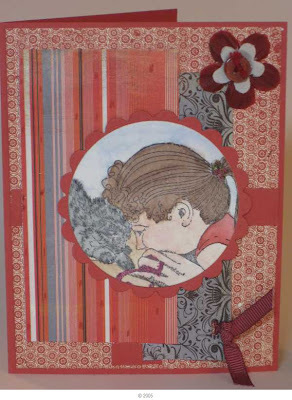 Bloggers Challenge "Love" 2nd Submission and Happy World Card Making Day! I had a little free time and took a break from making the scrapbook, so I decided to make a card today. I decided to make a card with a "Love" theme as well, and took out the new TJ newsletter. I tried a background called embossed crayon resist. I have to admit, I like it better IRL better than in the picture.... I played with it in photoshop, but when I get the true 'yellowish' color of the BG, it makes the elephants look blue...... They are gray. I used one of my new Cuttlebug folders- called Moroccan Screen. I used Distress Straw and Dried Marigold Distress Inks to enhance the green and orange. After the BG was prepared, I stamped the elephants from Elephants on Parade by Firecracker Designs by Pamela in Black Memento Ink and colored them with Copics C2, C3 and C5. Do you notice where their trunks meet it forms a heart? And, the one on the Rt has tusks and the one on the Lt does not...... For the sentiment I cut the words apart and mounted each word separately on Old Olive CS. The layers are sewn together with orange sulky (embroidery) thread (which has a shiny sheen), as well as the top layer of the Fleur De Lis Spellbinders Borderability (from Cut at Home). The card stock is Pumpkin Pie and Old Olive from Stampin Up. I am going to check out some of the challenges for World Card making Day over at Splitcoaststampers today, they begin at 9AM Central Time. This is my Bloggers challenge about LOVE. It is for my daughter Katie. 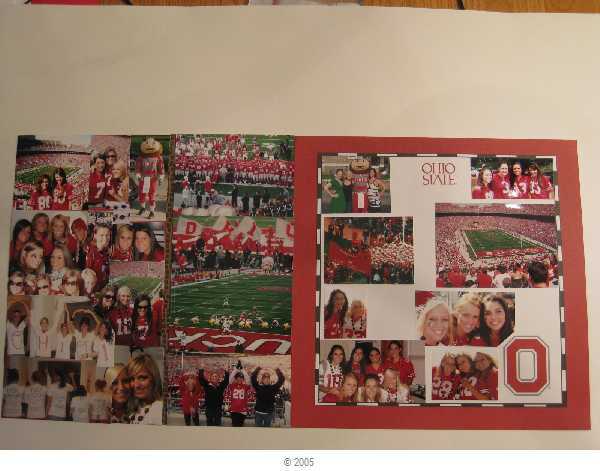 Katie is in the Chi Omega Sorority, and each year I make a scrapbook for the Make a Wish auction put on by the sorority at a tailgate. The sorority invites members families and friends and alumni. (Last year, they raised $24.000). I am not really a 'scrapbooker', so thanks for humoring me as I make an attempt to make some $$$ for this group. Each year, for some reason, I start at the last minute and I guess that is how I roll! I have uploaded pages 2-7 here for the love challenge. Elevenn more pages to go! This is a close up of how I accomplished the flip open pages- I took one sheet of red, added the top picture flat on the page. i added 1/2 of extra card stock behind each photo, and scored it, then taped it to the BG. I added googlie eyes to mimic the owl eyes of the 1st page. I am pretty silly, so I am hoping that is not too goofy- I think it is cute. 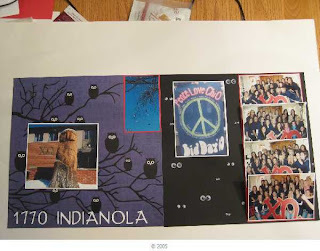 The banner is one that was hanging outside the sorority on Bid Day- when the new Freshman are invited to join. The new girls' names are all on the circle around the peace sign. I think the girls that made this did a fabulous job on the banner- I have no idea what paint was used or what material. 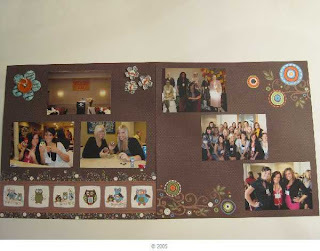 This is the next set of pages is one of a workshop type day for the sorority- teambuilding I would imagine! This is a new Technique Junkies technique- embellishing flowers. I bought a a bunch of 50% off flowers at Joann, and took all of the flowers apart. I made this a pale turquoise to match the blue in the CS, then decided to add shimmer mist on the top. I stamped the flower with SU Sweet Little Sentiments. I added a button and some DMC. You can see on the Lt page on the right top, I made 3 more flowers-I decided to stamp them with Lexicon of Love and instead of coloring them, just added shimmer mist. 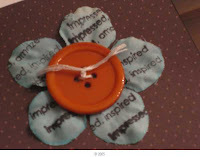 Then, I added color by tying DMC orange 921 in the center of the buttons. I like the way this looks! (The purple owl paper above is S-E-I Eerie Alley Hoo's There). I bought all of the BG papers from Archivers. Finally, this is the football pages...........side by side. I had a much more elaborate page planned, but had some great pictures i did not want to cut- don't you love the pictures of the Stadium on the LT page??? I added a strip of Cuttlebug Highlighting on the Lt side of those great pictures, but you can barely see it. It looks like a football to me. 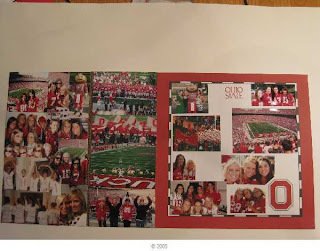 The BG paper is from a College Scrapbook page for The Ohio State. Thanks for looking- I am going out of town for a couple of days- will be bck to stamp and make 11 more pages for the scrapbook on Sunday. If you are like us, we are getting so many requests from Charities right now for $$$. In fact, the phone is ringing off of the hook! I feel so blessed right now to be able to donate to this fundraiser, and I hope the scrapbook makes lots of $$$ for the make a Wish Foundation!